Do you like to paint your miniatures? Embellish them a little? Customize them? This is your chance to get some different bases for your miniatures that will add variety and color to your collection. 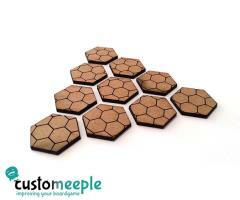 Get a pack of hexagonal bases with hexagonal designs for your miniatures. The hexagonal shape makes them compatible with miniature games with hexes like Dreadball or Battletech.